Third Party Inspection: Lloyds, BVIS, SGS, TUV, DNV, etc. Leveraging on vast infrastructure, we are capable of manufacturing and supplying an exclusive array of Vertical Storage Tank. 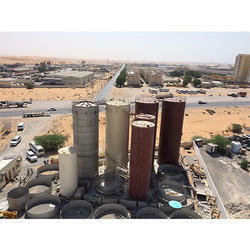 - Used in various industries for storing different types of material vertically. Backed with our adroit team of professionals, we are able to provide our clients with an assorted gamut of Vertical Storage Tank (45 KL Furnace Oil Vertical Storage Tank).